Beautiful shots of the bird. I agree. I never ceased to be amazed by the variety of wildlife in a city. Your photos have really captured the wonderful blue colouring. 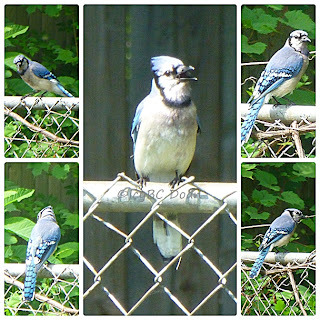 Great shots of the bluejay singing. I love your collage of this beautiful but noisy bird. We've got a family of them at the cottage, and the young (now as big as the adults) are very noisy in demanding to be fed! It's so much fun to see the adults come and get peanuts and go up and share with the young who are waiting up in the trees. well hello there, mr. jay. you look mighty fine today. Lovely photos! I agree. I like seeing and hearing birds around our house. I love the bluejays, even their loud calls. Wonderful photos and mosaic! I agree, jays are loud. That gorgeous color makes up for the obnoxious racket, though! What lovely shots of the bird! Mnie by wcale nie przeszkadzał głos tych ślicznych ptaków. Pozdrawiam. I did not bother to vote these cute birds. Yours.